From March 28 to 30, 2017, LOPEC will once again be opening its doors at the Messe München fairground. In addition to the international exhibition for printed electronics, visitors can expect a broad conference program with around 200 presentations from renowned industry experts and scientists from across the world. Speakers include representatives of AU Optronics, Cambrios Advanced Material, Samsung, and the European Commission. Whether it is conductive nano-inks, flexible displays, or 3D printing of electronic components: The LOPEC Conference 2017 will shed light on every facet of printed electronics, from the laboratory right up to practical application. “An international committee made up of leading industry representatives and scientists has put together a program aimed not just at insiders, but also at end user industries,” says Wolfgang Mildner, General Chair of the LOPEC Conference and CEO of the consultancy and technology company MSW. The conference, which is split into the three blocks of Business, Technology, and Science, will this year focus on applications for printed electronics in the fields of medical technology, automotive, and consumer electronics. The highlights of the conference include plenary speeches from Dr Sang Yoon Lee, Senior Vice President of Samsung Electronics from Korea, and Jennifer Y. C. Lin, CTO of AU Optronics from Taiwan, the largest manufacturer of LCD flatscreens. Lin will discuss the benefits of printed electronics for display manufacture, while Lee will provide an insight into Korean activities and state subsidization programs. A speech on EU initiatives and the success of European funding policy in printed electronics will be held by Khalil Rouhana, who is responsible for Directorate A/Digital Industry at the European Commission. Representatives of the companies ISORG (France) as well as Cambrios Advanced Material and FlexTech Alliance (USA) will also be giving talks during the plenary. How is the market for printed electronics evolving? What are end user industries looking for? Many such questions in relation to commercial aspects will be answered by representatives of industry giants from Asia, Europe, and the USA at the LOPEC Business Conference on March 28. On the same day, 90-minute Short Courses will take place, providing information on key technologies such as printed photovoltaics and biosensors. Under the slogan ‘Science in Dialog’, the Scientific Conference on March 29 and 30 will bring together renowned researchers from all over the world. They will be discussing the scientific foundations for new manufacturing procedures, printing and encapsulation materials, as well as smart textiles and printed components for energy storage systems. Another ideal opportunity to exchange views with researchers is the Poster Session on March 29. The best poster produced by a young scientist will receive the LOPEC Student Poster Award on March 30. The Technical Conference on March 29 and 30, on the other hand, will focus on product innovations and technologies that are already on the market or are likely to be launched in the near future. For example, Novasentis from the USA will be reporting on how haptic sensors can bring the sense of touch to virtual worlds. “More and more branches of industry are using printed electronics in order to produce new products and design options”, highlights Wolfgang Mildner. 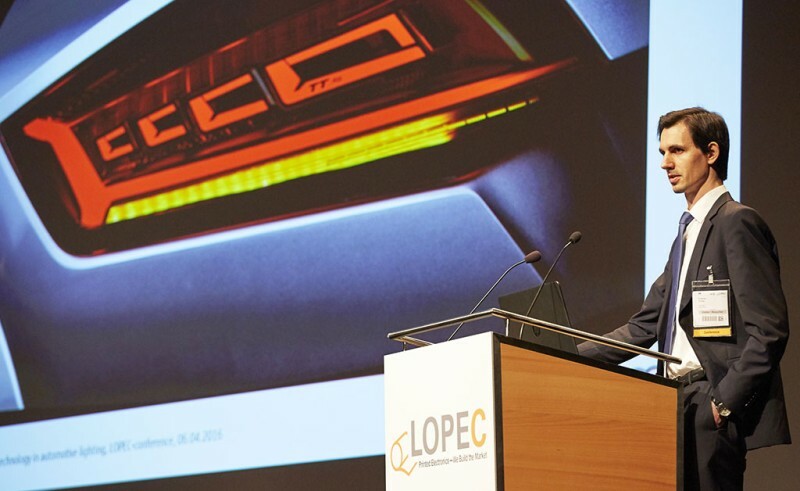 The LOPEC Conference underlines the potential of printed electronics, and demonstrates by way of numerous examples how visions can be transformed into real products.